I tried out this recipe from my favourite cook book ~ delicious, Frugal Feasts. ..only to discover that the same recipe could be found online. Oh, the unfairness of it all. ..still, I wouldn't trade my printed copy for anything in the world! 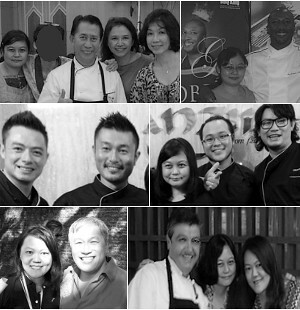 I'm just someone who love flipping pages and bookmarking recipes with a pretty pin or coloured post-it notes. This is probably the best burger I've ever made. The meat patty was very juicy on the inside and has a light sweetish taste. Adding the apple certainly worked wonders. Because it tasted so delicious, I will most likely include some sort of fruit into any meat patty I make in future. That's right, all patties will have f-r-u-i-t! Here's the deets on how I did mine, but please do read the original recipe (shared above) because it is "tried, tested and tasted". That means it is finger-licking good. 1. 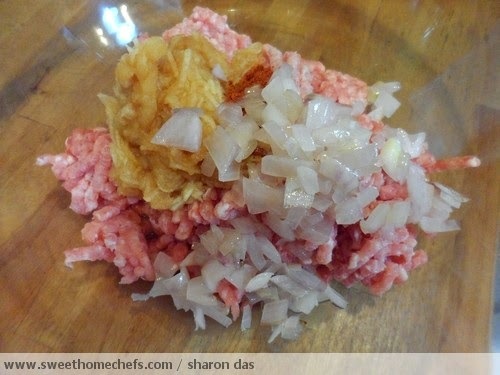 Mix all the ingredients for the meat patty together. 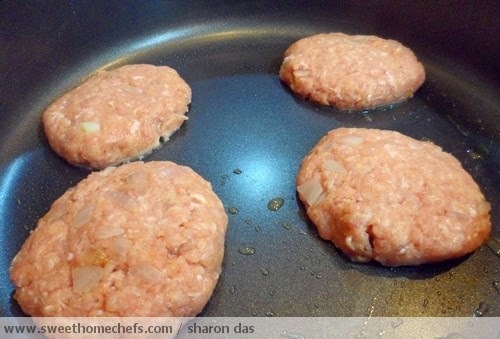 Shape into round patties (4 small patties for me). 2. Heat olive oil in pan. Fry patties until cooked, which took about 3 minutes on each side on medium heat. 3. 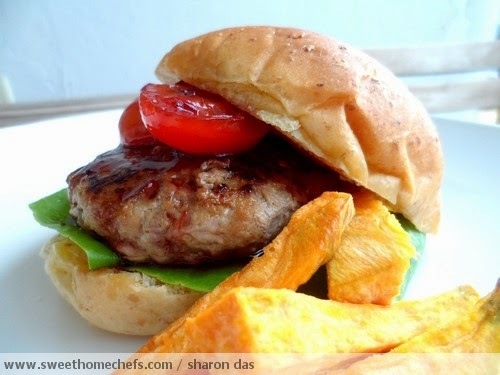 Remove patties and place wholemeal rolls on pan, face down until lightly browned. 4. 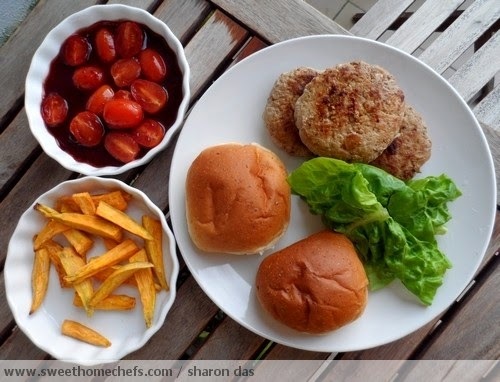 To serve, place greens on top of the bottom half of the bun, followed by one meat patty. Top with grape cherry tomatoes in strawberry jam. Eat with sweet potatoes on the side. Tadaaaa...! 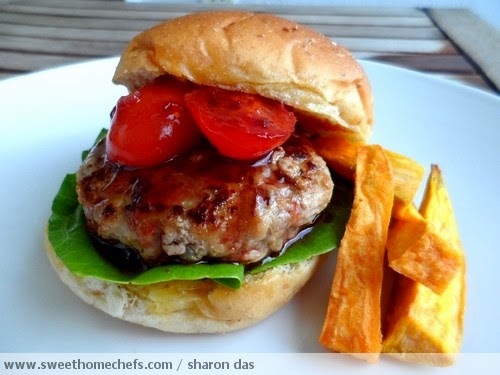 Delicious Pork Apple Burger ready to be served. I'm drooling...these look delicious! Enjoyed going through the process in your pictures! look very interesting recipe !!!!!!! I love it too ~ this is a juicy one !